This type of missions is designed to help players become familiar with game systems and guide them how to use various functions in the game. During the process, an arrow will point to where players need to go or click in order to complete the tutorial mission. Most of the missions will also be assisted by an Officer who will explain each function in detail. After completing tutorial missions, players will begin the main missions directly, which includes improving the player's strength, challenging combat operations, Sector Clash, etc. After completing tutorial missions, players will receive exploration missions such as exploring different sectors and unlocking planetoids. After completing the tutorial mission, players can carry out base development missions such as upgrading certain buildings in the home base and leveling up technologies. Missions are listed in the mission box at the main interface. Players do not need to accept mission manually. When they complete a mission, a new mission will appear in the mission box automatically. When players complete the goals specified in the mission description, the mission is completed. After completing a mission, click the reward icon in the top right corner in the mission box to claim rewards. Complete a Sector Clash battle. 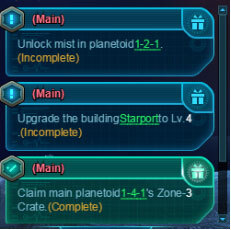 Unlock mist in a sector. Loot resources on a planetoid. Collect resources on a planetoid. Claim an area crate in a sector. Upgrade to a certain level. Upgrade an affiliate ship to a certain level. Upgrade an officer to a certain level. Click the green word in the mission box to jump to the target location. For example, the mission shown above asks players to unlock "Planetoid 1-2-1". If players do not know where the planetoid is, they can click "1-2-1" to jump to the location of the planetoid.